The time has come. It can't be avoided it any longer. I've had to bite the bullet. Accept the inevitable. Bow to the pressure. I've got to stop buying lip products for a while. Quite simply I'm rapidly running out of storage space for them! 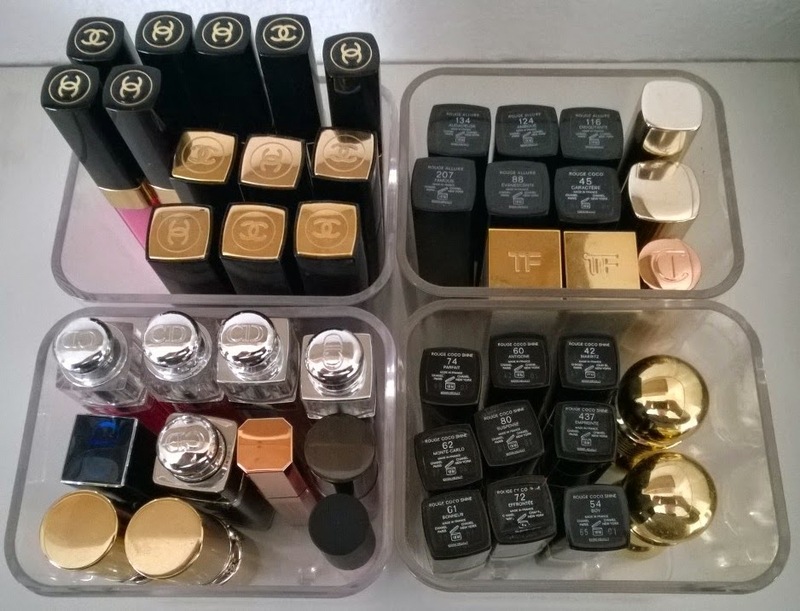 Now, there will be those among you who may think that's an insane amount of lippy for one person to own. There may be some out there who are bloggers or collectors or makeup artists and think, pfffffft, that's nothing. There may be others among you who think, as do I, that this is quite a reasonable, respectable sized collection. Unfortunately (for me!) I have a finite amount of space available for my makeup (I'll be doing a full post on how I store my makeup in the very near future) so when that space is gone, that's that. Bye-bye more purchases for a while. As you can see, I'm really into Chanel lip products :-) I also have some Dior, YSL, Dolce & Gabbana, Charlotte Tilbury and Tom Ford. And yes, I do wear them all and yes I do use them up! There are several in that picture that are almost finished and they're the ones that will be pulled out to be used up first. For those interested, the containers are from Ikea. They're actually labelled as bathroom storage but as you can see, can be used for anything. I bought them about four years ago and they're still available. Cheap-as-chips, which is brilliant, see-through, which makes reaching for stuff easier, neat and tidy and looks good too - even better.